This 3D visualization was created using imagery from the Hubble Space Telescope. 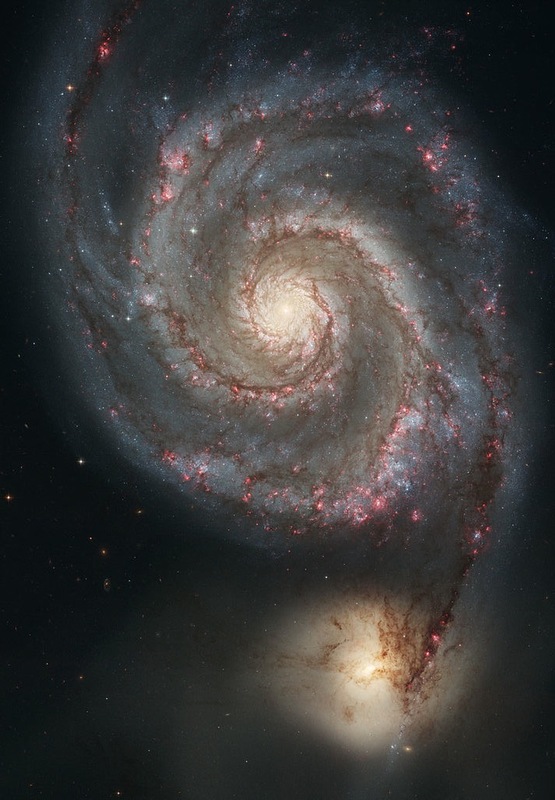 This animation uses visible light (Hubble) and X-ray (Chandra) images to highlight different structures within the Whirlpool galaxy (aka Messier 51). A second smaller spiral galaxy can be seen in the upper-right portion of the image. This composite image of the Whirlpool Galaxy and it’s nearby companion galaxy overlays radio astronomy data from the Very Large Array with optical data. The image in white shows how the galaxies appear to optical telescopes: one giant spiral galaxy with a smaller one hanging off an arm. The VLA sees a much bigger picture. The blue overlay reveals the the cast-off gases that were once in the outer spiral arms of these galaxies which have been pulled apart as the smaller galaxy has moved passed the larger one. The Whirlpool Galaxy (M51A or NGC 5194) and its companion dwarf galaxy (M51B or NGC 5195).